theme for Table 21 was Big Night, a movie based on this very concept. In the film, two Italian brothers move to the United States where they open their own restaurant serving traditional Italian dishes, which falters due to the lack of American exposure to authentic Italian cuisine. To save the restaurant, the brothers attempt to serve Americanized Italian food that their customers demanded. In keeping with the theme of Big Night, Table 21 enjoyed several “fake” Italian dishes from the film. The first dish presented was pasta with meatballs and mountains of cheese. 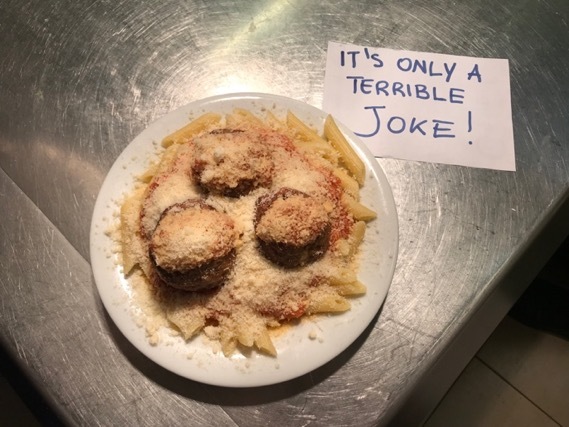 Meatballs are not classically Italian, and the cheese was a play on a scene in the movie in which a customer continuously asks for more cheese, without first even looking at how much there already was on his plate. The second dish presented was a very cheesy chicken alfredo. Americans believe that alfredo sauce is the peak of Italian cuisine, when in reality alfredo sauce doesn’t exist here! The third and final themed dish of the night was a cacio e peperisotto. While both of these dishes exists separately as Italian classics, putting them both together makes for a funny reference to the customers in the movie who don’t actually know anything about true Italian cuisine. While the theme kept the atmosphere at Ganzo light and comical, the food itself was well received and enjoyed by the patrons of Table 21. It may not have been true Italian cuisine, but keeping in mind that it was all in good fun, there was hardly an unclean plate in sight. This entry was posted on Friday, March 29th, 2019 at 9:00 am. It is filed under Tavolo 21. You can follow any responses to this entry through the RSS 2.0 feed.